We've finally made an OC2! For more information check out the Kikaha page. To get on the order list visit our online store. Gone are the days where one size fits all. Introducing the new Pueo X. Last Summer we hit the drawing board to figure out the next step in OC-1 hull design. In an effort to improve flat water speed and surfing performance, we changed the rocker, lengthened the waterline, and narrowed the body. As we expected, the canoe dropped in easier and was faster in the flat. But, after four months of testing we discovered that the new canoe had one critical flaw: elite paddlers simply couldn’t drive the new hull up and over bumps like they could on the Second Gen Pueo. So we came back to the computer and started exploring more options. The goal was to maintain the performance gains of that hull (flat water speed and better drop-in) while ensuring that it could still climb over bumps. After months of computer modeling and simulation, we discovered the hull that we were looking for. 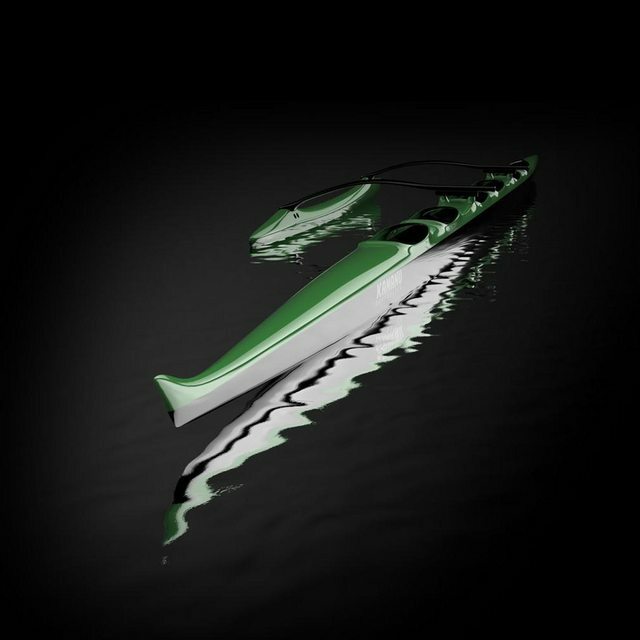 Through a substantial change to the front and back rocker of the 2nd Gen Pueo, we had a computer model of a canoe that theoretically would perform better in both the surf and the flat, yet wouldn’t bog down while carrying over waves like the earlier prototype did. With our plan solidified on the computer, we built a prototype and got to testing. Since January, the new prototype has been raced by a number of our team riders. She ended up winning several races including Koa Nui and Kanaka Ikaika Race #4. We made a mold in April and built seven canoes for this year’s Moloka’i Solo. The race went well with Travis Grant winning on the prototype and Kekoa Kau earning a top 10 finish on the first production boat out of the mold. Those results are better than we could have asked for from a new canoe. However, because of mixed reviews from some of our team riders, we held off on announcing the update and spent the last few months trying to figure out the wide variance in feedback. Between extensive on-the-water testing and the data generated by our computer models, we’ve found some interesting and non-intuitive results. Reducing rocker and creating a longer waterline makes a canoe more sensitive to trim, but we didn’t initially realize just how much it would affect the Pueo X. Gone are the days where one size fits all. To take advantage of the improvements, we need to place the paddler more accurately near the center of buoyancy. But, this is harder than it sounds. The features that make a hull surf better also make it less symmetric front to back. This causes the center of buoyancy to shift depending on the paddler's weight. To a certain extent, this has always been happening, and it is one reason why a tall and heavy paddler could make a Pueo perform similar to a short and light paddler. But, the changes on the Pueo X amplify this effect to the point that it’s beneficial for smaller paddlers to sometimes be significantly farther forward than heavier paddlers. So, for example, if two paddlers are both 5’8”, but one is 130 lbs and another is 180 lbs, the lighter paddler should actually be sitting at least 2” farther forward to achieve the same trim. We know it’s confusing, so we’ve created a sizing chart to choose the best Pueo version for you. We have also simplified both our pricing and the terminology for the lay-ups. Click here for more information on the Pueo X. If you have any questions please give us a call at 808-228-8609 or shoot us an email at info@kamanucomposites.com. In 1976 Tahiti dominated the Moloka’i Hoe for the first time in a Tahitian canoe, the Tere Mata’i. Hawaiian paddlers spent the next year embroiled in debate over what constituted a Hawaiian outrigger canoe and what should be allowed to race in Hawai'i. Ultimately, a narrow-minded argument that defined the Hawaiian outrigger canoe as a historical snap shot of history outlawed all designs from Tahiti. Instead of allowing the ocean to dictate the design, the Hawai'i governing board of paddling voted to halt the evolution of outrigger canoe design in Hawai’i. All because the Tahitians outperformed us in our own waters. On the starting line last Sunday was the most competitive, internationally diverse field ever assembled on OC-1s. There were a dozen paddlers with realistic shots at winning: Kai Bartlett, Jimmy Austin, Danny Ching, Steeve Teihotaata, Rete Ebb, Manutea Owen, Maitai Danielson, Heiva Paie-Amo, Manny Kulukulu’alani, Daniel Chun, Kua Nolan, and Travis Grant. For the first two hours of the race Maitai maintained the lead, followed by a rotating line consisting of Danny, Steeve, Rete, and Travis. Just behind the lead pack was a scattering of Kua, Will, Kaihe, Makana, Jimmy Daniel, and Heiva. Hovering back around 20th place was Manutea Owen. And Kai Bartlett was by himself on a northern line. At about the mid-way point, the pack broke up. Rete, Travis, and Danny went slightly south; Jimmy dropped back and pulled out; Maitai and Steeve continued to battle on the rum line with Manutea, Heiva, and Manny a few hundred yards behind; Kua, Daniel, and Kainoa Tanoai went slightly north; and Kai Bartlett continued on his northern push. At two and a half hours in, nearly every one of the top competitors was within a minute of the lead. It was anyone’s race. Travis, in an attempt to capitalize on the growing south wind, moved further south, leaving Danny and Rete to battle side by side on their slightly southern course. On rum line above them was Steeve, followed closely by Maitai and Manutea with Manny and Heiva battling behind, and the Big Island group of Daniel, Kua, and Kainoa dropping slightly behind to the north. In the meantime Kai was rapidly closing the gap on his northern route. About three miles off of Port Lock Rete broke off from Danny and quickly assumed a powerful lead, followed by Steeve in the north on his rum line route. Manutea made a slight push to the north and got stuck in sticky water off the Portlock Wall, as Danny, gaining in momentum from the south, shot in ahead. With a minute separating each of them, Rete, Steeve, Danny, and Manutea rounded China Walls. And then it was over. Steeve, became the first person to ever win both the Super Aito and the Moloka’i Solo. And Danny Ching, in another super-human performance, was able to battle the Tahitians all the way across. Rete, after being in command of the entire race, ended up in third, with Manutea fourth, Heiva fifth, Manny sixth, Kai seventh, and Maitai eighth. Coral Darbishire, finishing in 34th overall in the most competitive solo in history became the first woman to beat Lauren Spalding in the Moloka’i Solo. Vance Hashimoto finished strong as the first person ever to race the Moloka’i Solo in a V-1 (though the crossing has been made by others in the 70s, such as Tommy Holmes and Paul Gay). All in all, it was an incredible historic day and an awe-inspiring performance by everyone out there. 2014 Pa'a Kaiwi Channel Solo World Championships from Makana Denton on Vimeo. 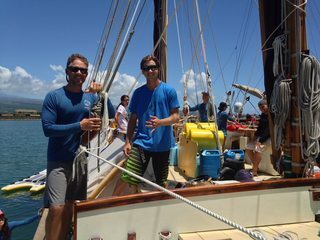 Hokule'a and Hikianalia are departing from Hilo today on the first leg of the three-year Malama Honua Worldwide Voyage. The traditional polynesian voyaging vessels are expected to arrive in Tahiti around June 26th. Kamanu Composites is honored to have played a small role in contributing to the voyage. Three Kamanu canoe builders are active contributing members of the Polynesian Voyaging Society: Keho’oulu Fukumitsu, Gregory Eckart, and Jason Patterson. And, over the past several years they have used Kamanu as an unofficial "satellite shop" for certain parts of the refurbishment of Hokule’a, including the finishing of her deck boxes and other small composites related tasks. But, what we are most proud of today is the fact that Jason and Greg are about to embark on this historic first leg of the worldwide voyage. Greg is a crew member on Hikianalia and is the assistant carpenter, medical liaison, science educator, and rescue swimmer. Jason is a crew member on Hokule'a and his kuleana include student navigator, documenting assistant, still photographer, sail maintenance, and repair and rescue swimmer. From all of us at Kamanu, good luck and safe travels as you perpetuate the ancient art and science of traditional Polynesian voyaging.